THE B-MOVIE NEWS VAULT: If you miss out on Scream Factory's CARRIE Blu-ray this October, they're all gonna laugh at you! If you miss out on Scream Factory's CARRIE Blu-ray this October, they're all gonna laugh at you! BRIAN DEPALMA'S "CARRIE" BECOMES PART OF SCREAM FACTORY'S IMPRESSIVE CATALOG ON OCTOBER 11TH! Scream Factory just keeps the good news coming! Along with announcements for a definitive edition of John Carpenter's THE THING, new Collector's Edition Blu-rays of CHILD'S PLAY and THE EXORCIST III, plus other cool titles like FENDER BENDER, and WHAT WE BECOME, I just can't seem to reign in my excitement! Film Synopsis: Based on the best-selling Stephen King novel, this "absolutely spellbinding horror movie" (Roger Ebert) has become a pervasive, pop-culture touchstone for anyone who's ever wanted to get even. Sissy Spacek and Piper Laurie deliver Oscar-nominated performances, and John Travolta and Amy Irving are terrific in this ultimate revenge fantasy that has become one of the all-time great horror classics! At the center of the terror is Carrie (Spacek), a high school loner with no confidence, no friends... and no idea about the extent of her secret powers of telekinesis. But when her psychotic mother and sadistic classmates finally go too far, the once-shy teen becomes an unrestrained, vengeance-seeking powerhouse who, with the help of her "special gift," causes all hell to break loose in a famed cinematic frenzy of blood, fire and brimstone! NEW! Interviews With Writer Lawrence D. Cohen, Editor Paul Hirsch, Actors Piper Laurie, P.J. Soles, Nancy Allen, Betty Buckley, William Katt, Edie McClurg, Casting Director Harriet B. Helberg, and Director Of Photography Mario Tosi! Acting Carrie – Interviews With Actors Sissy Spacek, Amy Irving, Betty Buckley, Nancy Allen, William Katt, Piper Laurie, Priscilla Pointer and P.J. Soles And Art Director Jack Fisk, and Director Brian De Palma. Visualizing Carrie – Interviews With Brian De Palma, Jack Fisk, Lawrence D. Cohen, and Paul Hirsch. 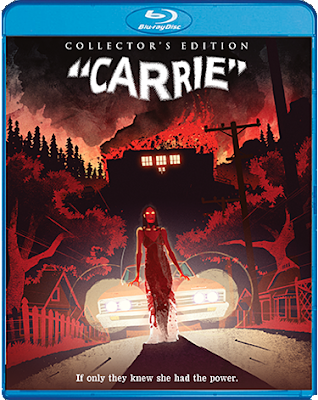 CARRIE: COLLECTOR'S EDITION will be available wherever discs are sold on October 11th, and will make a great addition to your current Scream Factory collection (which should already contain their double feature of CARRIE (2002) & THE RAGE: CARRIE 2)! 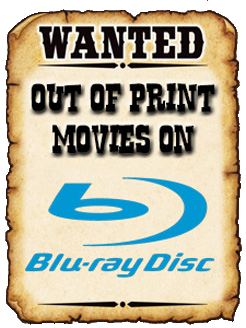 You can order your Blu-ray today from AMAZON.COM or directly from SHOUT! FACTORY.COM. If you get it from Shout!, you will receive your disc TWO WEEKS EARLY and receive an 18 x 24 poster of the new key artwork! So be sure to order ASAP because if you miss out on this, "they're all gonna laugh at you!"